RALEIGH, N.C. (AP) — Gonzaga's first stay atop the AP Top 25 this season ended following a pair of losses to highly ranked nonconference opponents. Now back at No. 1, the Zags look like they could stay there through the rest of the season. Gonzaga moved up a spot Monday to begin a second stint at No. 1, both times replacing Duke at the top. It spent two weeks at No. 1 after beating the Blue Devils to win the Maui Invitational in November, but Mark Few's team fell out after a December loss to Tennessee. Then came a loss at North Carolina, marking the first time the Bulldogs had lost back-to-back games since February 2014. But Gonzaga (27-2, 14-0 West Coast Conference) hasn't lost since. And the Zags are a national powerhouse rolling through a league ranked as the eighth best in the country by KenPom. The Zags have won 18 straight games with no opponent coming closer than a dozen points, the last game being Saturday's 102-68 victory over BYU. 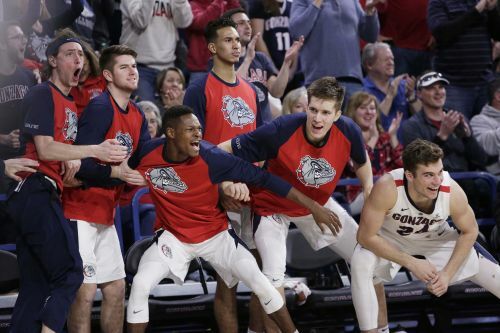 They play their final two regular-season games on the road at Pacific on Thursday and Saint Mary's on Saturday in rematches of games Gonzaga won by a combined 79 points. For the record, the final AP poll of the season runs March 18, the day after Selection Sunday. The Atlantic Coast Conference is hoarding spots in the top five. Virginia (24-2) moved up one slot to No. 2 and had 15 first-place votes, while the Blue Devils (24-3) slid from No. 1 to third. That came after Duke lost at home to rival North Carolina in a game that saw freshman star Zion Williamson go down with an injury to his right knee in the opening minute — complete with the image of his left foot tearing through his shoe as he fell to the floor. Duke, which earned a bounceback win at Syracuse without Williamson, still earned three first-place votes. Virginia and Duke are in a three-way tie atop the ACC with UNC (22-5), which jumped three spots to a season-high fifth behind Kentucky after the victory over Duke followed by a home win against No. 18 Florida State. The Tar Heels have won 10 of 11, with the loss coming to the Cavaliers — whose only two losses have come to Duke. Michigan State jumped four spots to No. 6 after winning at rival Michigan. Next came Tennessee, which spent four weeks at No. 1, followed by Houston — which at No. 8 has the program's highest ranking since Hakeem Olajuwon was starring for the Cougars in 1984. Michigan and Marquette rounded out the top 10. Kansas started the year at No. 1. Now the Jayhawks have their lowest ranking in more than five years. Kansas fell to No. 15 for the program's lowest ranking since January 2014. That followed a blowout loss to No. 11 Texas Tech, which was the program's most lopsided loss in any game since November 2014. The Jayhawks' run of 14 straight years with at least a share of the Big 12 regular-season championship is in serious jeopardy. No. 16 Kansas State and No. 17 Maryland had the biggest jumps of the week, each vaulting seven spots. No. 21 Buffalo joined Michigan State in rising four spots, while UNC, Texas Tech and No. 19 Wisconsin each climbed three. In all, 12 teams moved up in the new poll. Nevada (25-2) had the biggest tumble, sliding six spots to No. 12 after losing at San Diego State. Kansas slid three spots, while five other teams fell one or two spots. Wofford checked in at No. 24 for the first AP poll appearance in program history. The Terriers (24-4) are 16-0 in the Southern Conference and their only losses have come against power-conference teams UNC, Oklahoma, Kansas and Mississippi State. While Wofford was a first-timer, the other two new additions to this week's poll are familiar faces. Cincinnati returned at No. 23 after spending a week at No. 25 earlier this month. And Washington claimed the final spot at No. 25, the same ranking the Huskies had in the preseason poll before falling out. Still, that was significantly more change than last week, when no new teams joined the Top 25 for the first time all season. Reigning national champion Villanova (No. 17), Louisville (No. 18) and Iowa State (No. 19) fell out of the poll. This marks the third time this season the Wildcats have fallen out of the poll. They were No. 9 in the preseason before falling out for a week in November. They returned for three weeks, fell out for four, then returned for a six-week run.